Crafting with Bug is one of the seriously most fun things ever. It is really tricky to make things with littles, but part of the joy is that the gift is made by a little. So the fact that it looks like it's made by a little... well, I think that's part of the whole point! These ornaments are simple to make, all things considered. As always, when crafting with littles, make at least double of the item you're making to be sure you get at least one good item to give away. We made eight of these ornaments. Of those eight, we gifted two, kept one and threw five away. Mix the first three items together. Knead dough for 7 - 10 minutes. Roll out the dough on a floured surface. Take your baby's hand and gently press it on the dough. This is a very tricky part. Good luck getting a good handprint! It was very difficult for us. 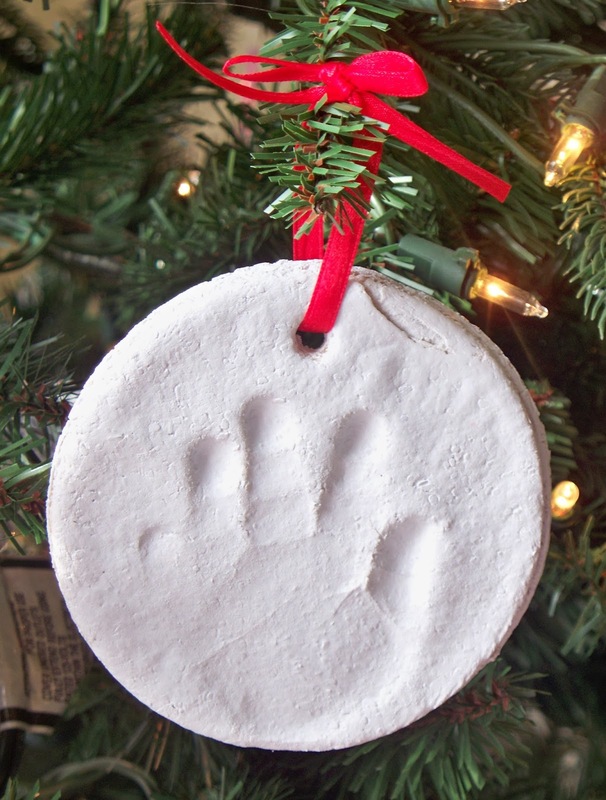 Using a bowl, cut out a circle around each handprint. Be sure to leave room at the top for a hole. Gently place each handprint circle on a baking sheet. Use a straw to poke a hole near the top. Bake in a 200 degree oven for a few hours, then let air dry for a couple of days. After the ornament is fully dry, sand the edges and any other rough spots down with sandpaper. Spray paint the front and back. We like the natural look of the ornaments, but there were flour bits on them we could not easily get off. So the ornaments would be a consistent color, we chose to spray paint them white. After the spray paint is dry, write your child's name and the year on the back of the ornament. After the ornament is completely dried (including the child's name and year), cut some ribbon and loop it through the hole. Tie a knot at the top. Bug's grandparents loved receiving these as gifts for her first Christmas. Happy crafting!